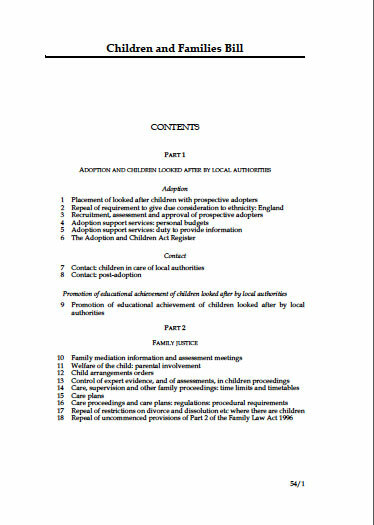 Just after 10am yesterday, the Children and Families Bill was released and I started to plough through. Not only did I have to read this Bill, I wanted to compare it to the draft Bill published last September, the Select Committee’s pre-scrutiny recommendations from just before Christmas and the numerous responses. All of this with a child off school with a chest infection and a husband at home who wanted to chat about decorating the bathroom - oh, and no in-house lawyer on hand to help. (d) the need to support the child and his or her parent, or the young person, in order to facilitate the development of the child or young person and to help him or her achieve the best possible educational and other outcomes. As a parent, I am reading this as “Dear Local Authority, you have to listen to me and my child(ren), and you have to give us the information we need in order for us to have an informed view”. Now, there are probably 1001 legal-type people shouting at this post and saying the local authority “must have regard to” is not the same as the local authority “must” and yes, I know there is a difference but I am trying to be positive. Throughout the Bill, clauses have been added or amended to clarify that parents and young people must be involved and their views listened to. So thank you Mr T, this is a move in the right direction. (5) Health care provision or social care provision which is made wholly or mainly for the purposes of the education or training of a child or young person is to be treated as special educational provision (instead of health care provision or social care provision). This doesn't put a duty on health but the LA do have a duty to secure the special educational provisions. There is no clarity however, as to which health care provisions this will actually mean and as there is still no duty on health with respect to the provisions within the EHCP, there are no guarantees. Next, we considered if the new Bill clarified that parents can apply for a EHCP assessment and the answer is yes. (1)A request for a local authority in England to secure an EHC needs assessment for a child or young person may be made to the authority by the child’s parent, the young person or a person acting on behalf of a school or post-16 institution. There appears to be no timescales for the LA to respond within the Bill, but we are constantly being told that the “devil will be in the detail” so this, surely, has to be announced in the draft Regulations which are currently being compiled. So, on to the next question "is mediation still compulsory" (an oxymoron if ever I heard one)? And the answer is no. It's still an option for families who wish to go down this route before Tribunal but no longer compulsory. So, I started to relax a little now but then had a big reality check. One huge (or as my son was said “gi-normous”) omission from the new Bill. Disability. Or to be more precise, disability without a special educational need. If your child has a disability and health and social care needs but does not have a special educational need then I’m sorry but you’re not part of the Plan. Despite several charities protesting and high profile campaigns, it would appear that the Government will not be providing the same opportunities to some of the children who need them the most. In the DfE’s case for change, it stated “Disabled children and children with SEN tell us that they can feel frustrated by a lack of the right help at school or from other services”. All of the proposals were clearly for disabled children AND children with SEN, not disabled children with SEN. So, what has happened? Every Disabled Child Matters has already commented on this and I will be supporting their campaign to give disabled children the same rights as those with SEN. When they launched the Green Paper, the DfE set out their cart and made us an offer, they clearly said “disabled children and children with SEN”. We all hoped that they were really listening to our families and then they changed the rules without explanation. If you're interested in what other groups have to say in response to the publication, I've listed all I can find here, if you know of others, let us know.